At a point in our existence, we have to marvel at the vastness of the universe. Only partially-discovered, our now eight-planet solar system is a fascinating subject for stargazers young and old. Whether you’re teaching your kids about orbits or simply indulging your nerdier side, our top fifty space-themed home décor accessories have the cosmos at their fingertips. House a real meteorite in a glass case, inside your library. 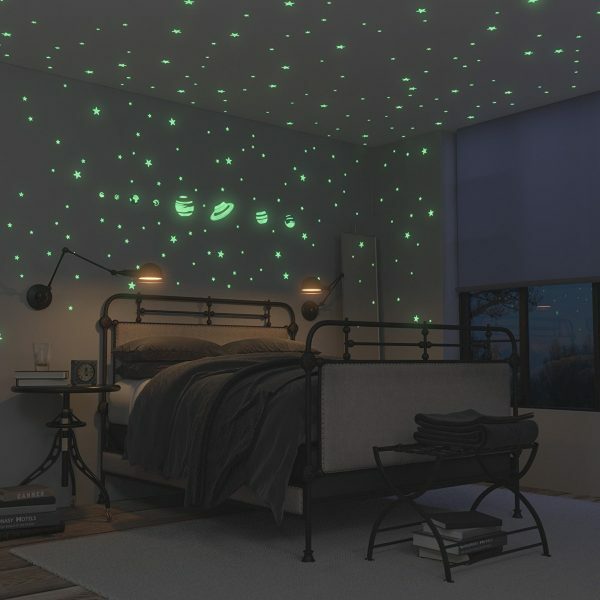 Place glow-in-the-dark constellations upon your children’s ceiling, for a night’s sleep they can dream to. Hang space travel advertising posters on your living room wall. Fulfill your space-age fantasies with a nifty pick from our list. 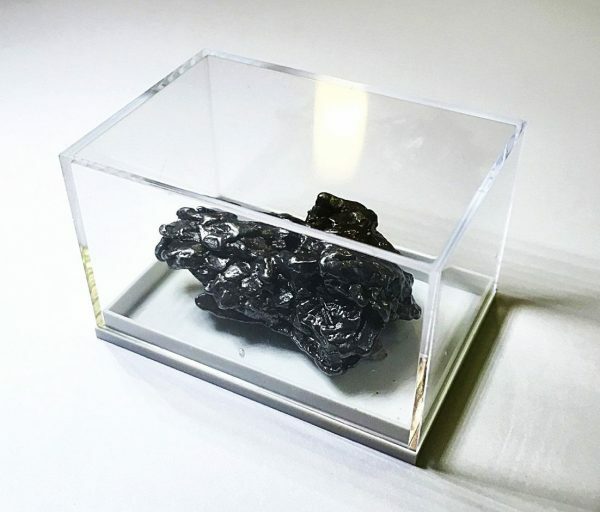 Genuine Meteorite Display Piece: Sourced directly from Argentina’s Campo del Cielo, these meteorites weighing up to 70 grams come with their own glass display case and certificate of authenticity. Place one in your library cabinet, for a gift from the stars. 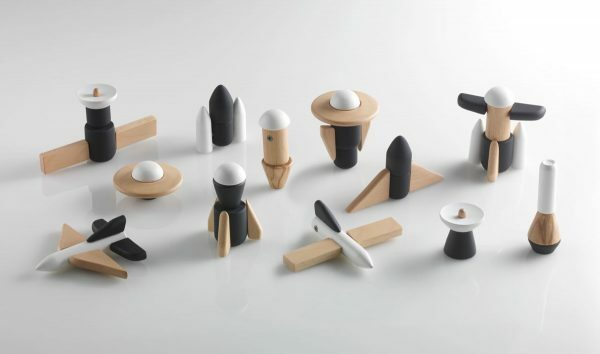 Huzi Cosmos Minimalist Space-Themed Building Blocks: Want an alternative to Lego with an educational twist? This seven-piece beech wood set of building blocks magnetically attach to form a world of their own. Laser Cut Metal Spacecraft, Satellite & Rover Models: Construct your own Hubble Telescope, Apollo Lunar or Mars Rover. 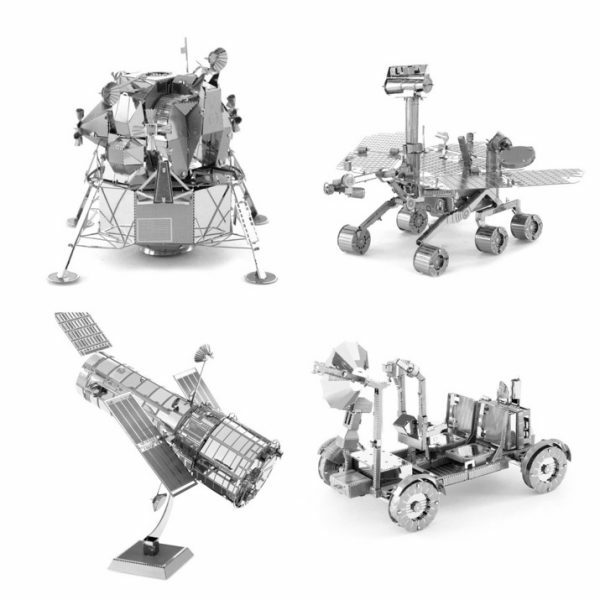 These four sets of spacecraft models add an intergalactic edge to your kids’ playtime. 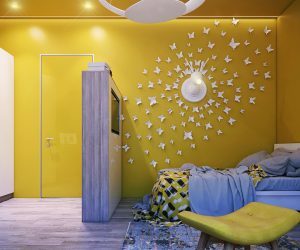 Space Shuttle Scale Model: Have a monochrome interior needing a pop of colour? 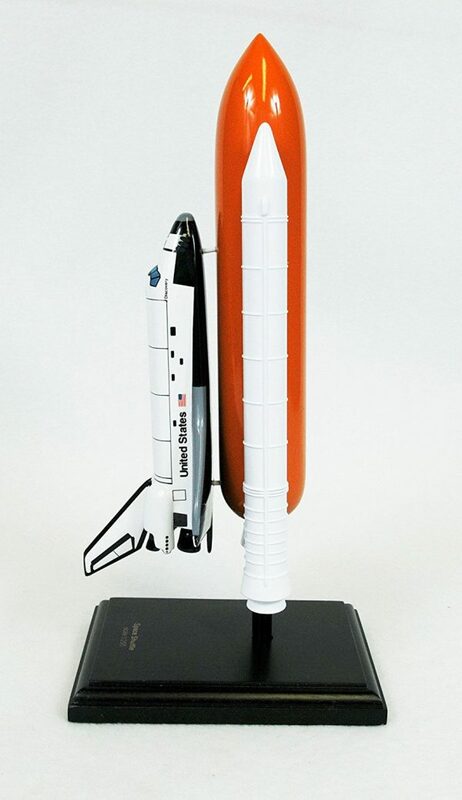 This NASA to-scale model is painstakingly crafted out of hardwood – with a bright orange burst down its side. 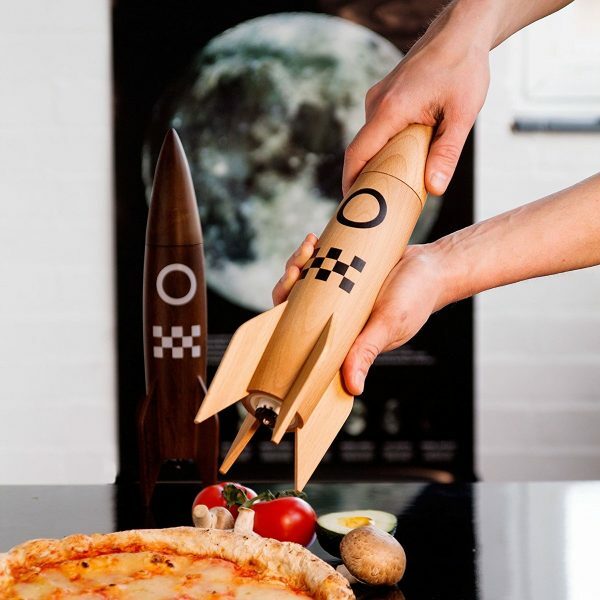 Tintin Moon Rocket: Lovers of TinTin will recognize this iconic rocket. Let its red and white checkers soar on your library shelf or kid’s bedroom table. 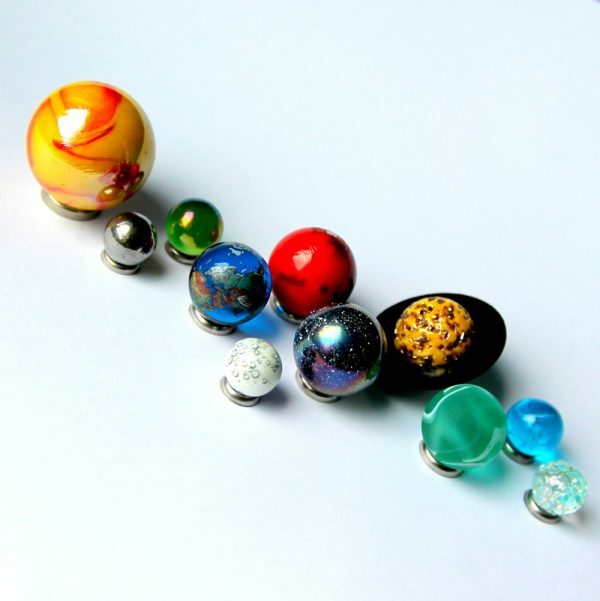 Solar System Marble Set: Available unboxed or in a classic display case, this set of planetary marbles make the classic game much more fun. Roll them with friends or keep their rounded forms static, with a handy ring retaining their position. 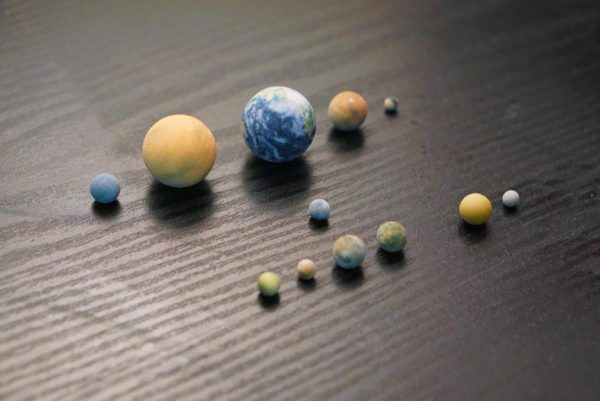 3D-Printed Planet Models: Show the whole solar system with the wonders of 3D printing. These to-scale replicas offer an easy demonstration on how our world works. 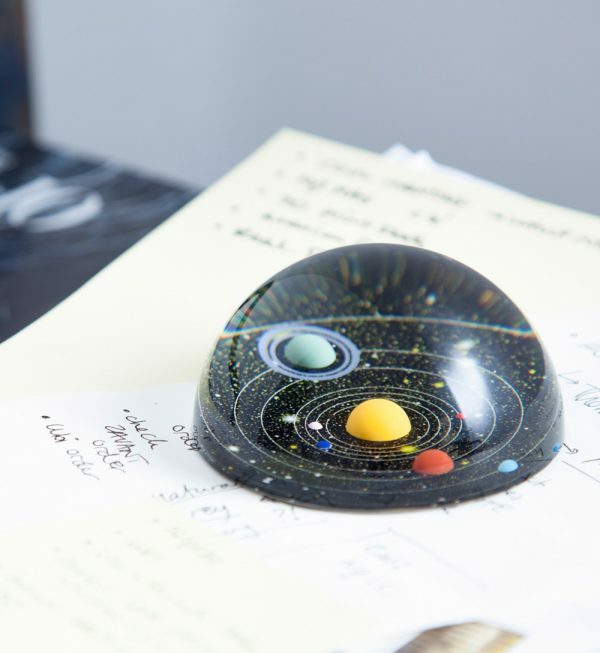 Solar System Paperweight: Give the gift that keeps on giving, with this glass solar system paperweight. Its domed form offers an almost three-dimensional look at the reaches of our galaxy. Planet Candles: Love Earth more than Venus? 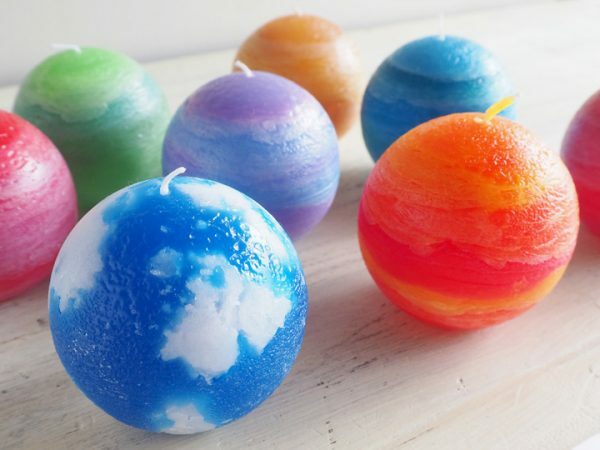 These handmade decorative candles from Japan let your favourite planet light up your bath time. 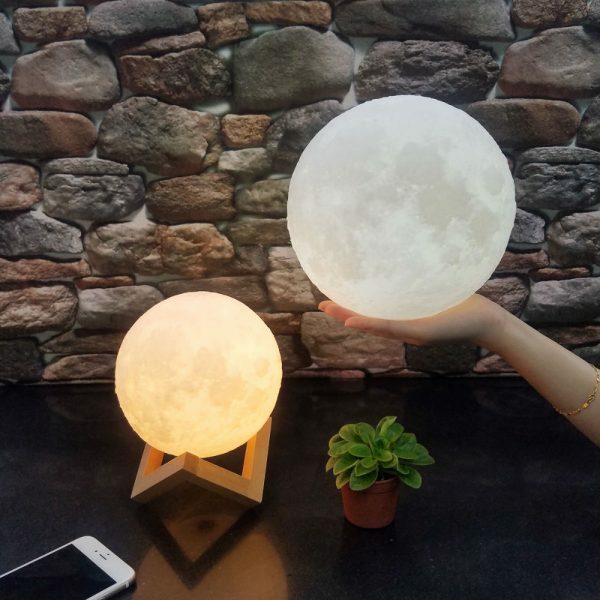 Glow In The Dark Celestial Sphere: Glowing in the dark and charged by the sun, this beautiful glass sphere lends a more interesting night light to the adult bedroom. 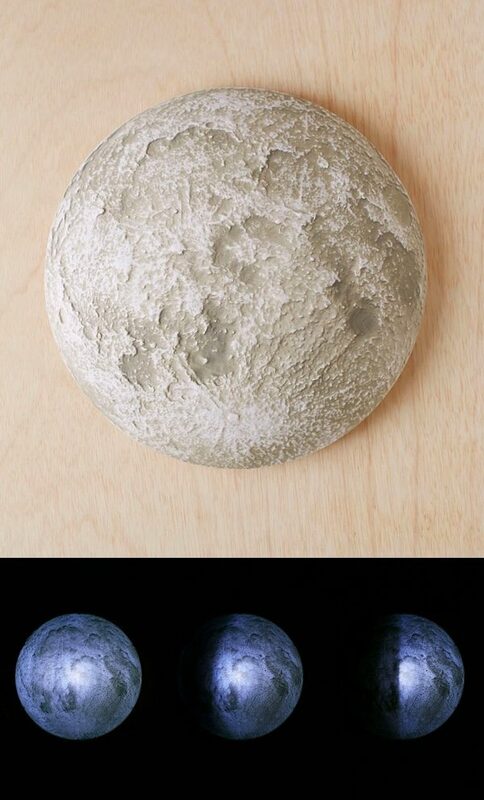 Space-Themed Moon Lamp: 3D printing has created four sizes of this many-layered lamp resembling the moon. 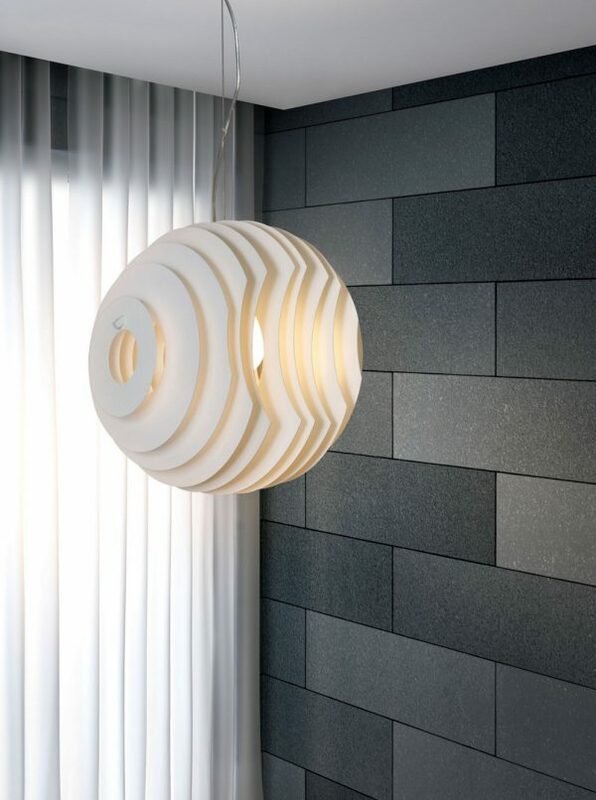 Moon-Shaped Wall/Ceiling Light With Phases: Wish you were outside camping beneath the moon? This ceiling light offers the next best thing, with a night light that shifts through the moon’s twelve phases. 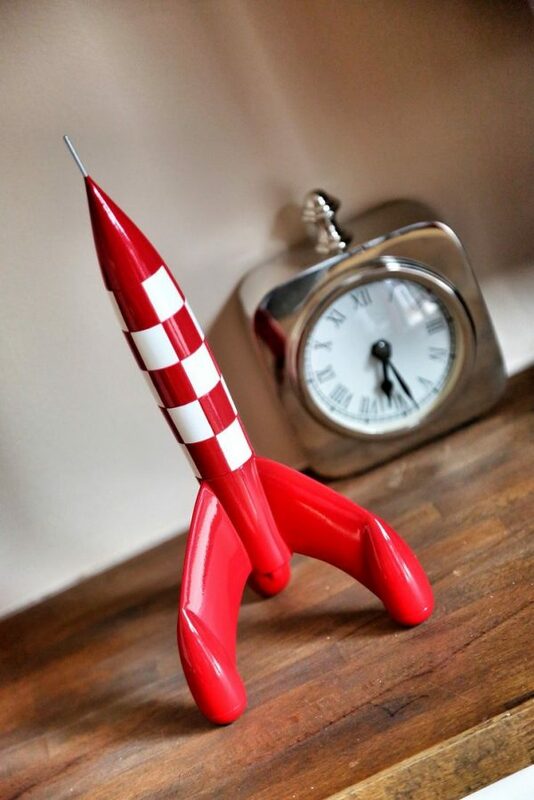 Rocket Night Light: Blast off to the land of nod, with this natural wood rocket light beside your child’s bed. Its handmade form is a perfect gift for a new arrival or baby shower. 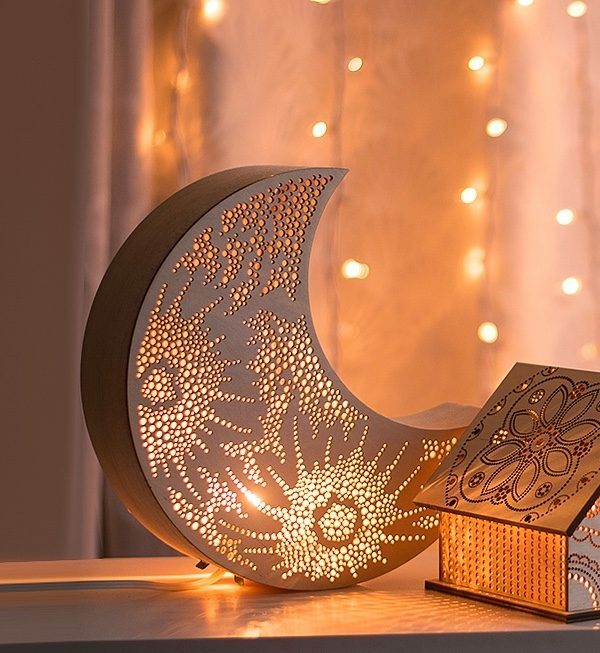 Crescent Moon Night Light: After a night light the adults can enjoy? This natural birch and balsa wood design spreads beautiful patterns from crafted cut-outs. Foscarini Supernova Replica: Go intergalactic in the dining room, with this Supernova replica above the dining table. 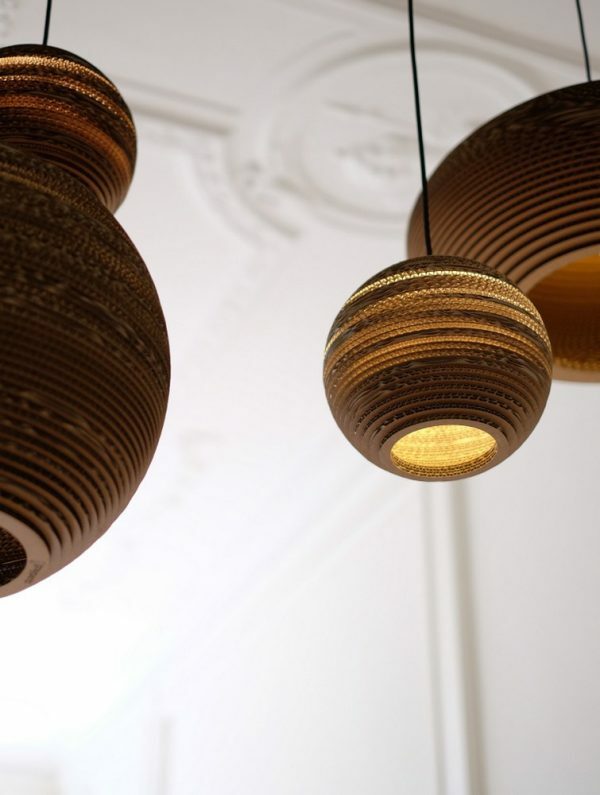 Its concentric metal discs overlap to create a light both functional and fascinating. 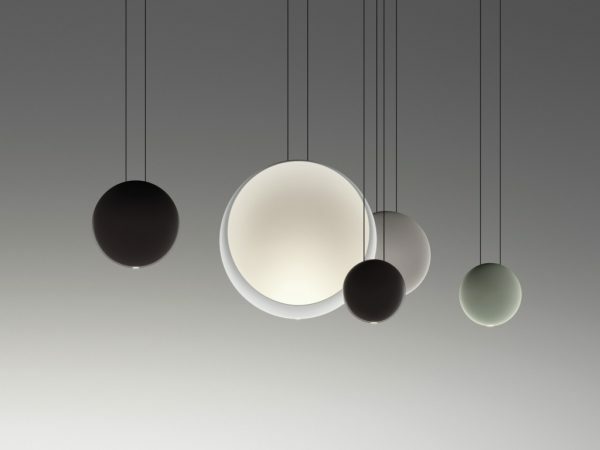 Vibia Cosmos Cluster Pendant Light: Want to watch the Earth orbiting the moon? These thermoplastic discs in light grey or green give a lit demonstration you can hang in your home. 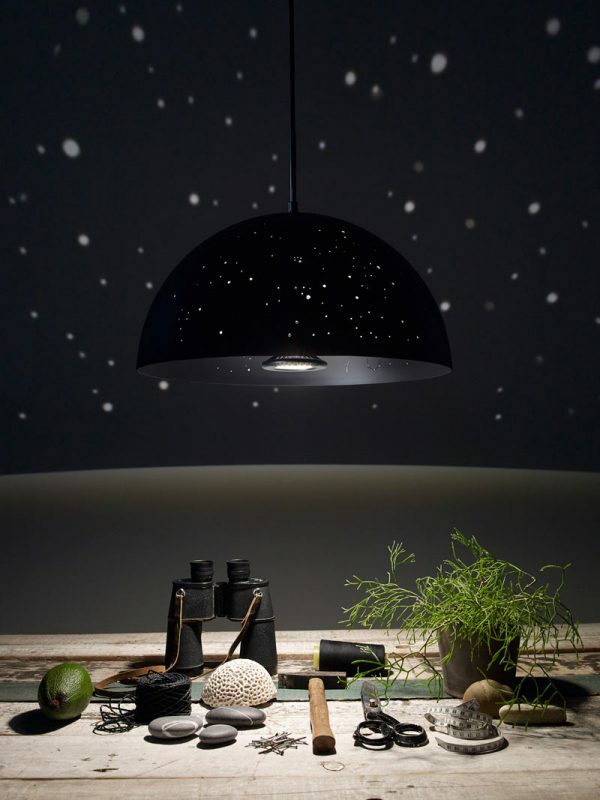 Starry Light By Anagraphic: Get as close as possible to the real night sky, with this black lamp mirroring the constellations. A specially-designed Milky Way-shaped LED maps their exact location to your home ceiling. 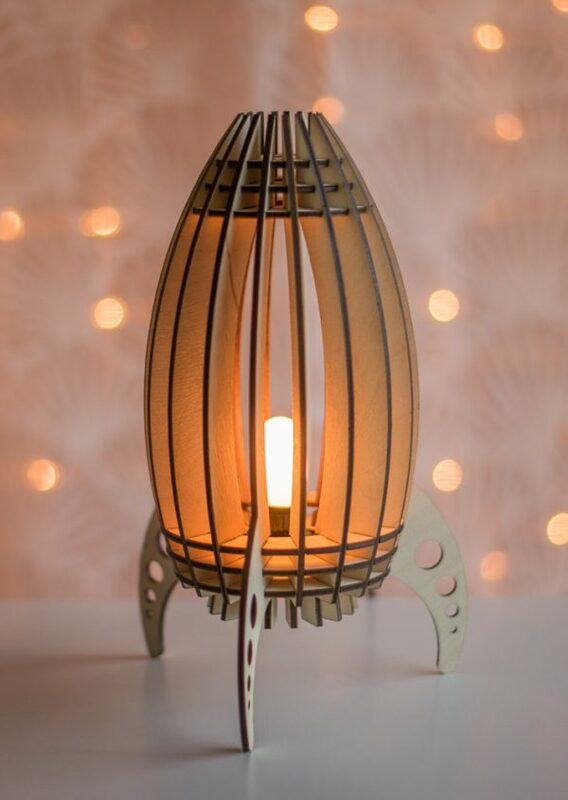 Moon-Shaped Pendant Light: Made of cardboard, the Moon Scraplight Pendant is a feat in paper light engineering. Affix it above your dining room table, to show how dining pendant lights can transform a room. 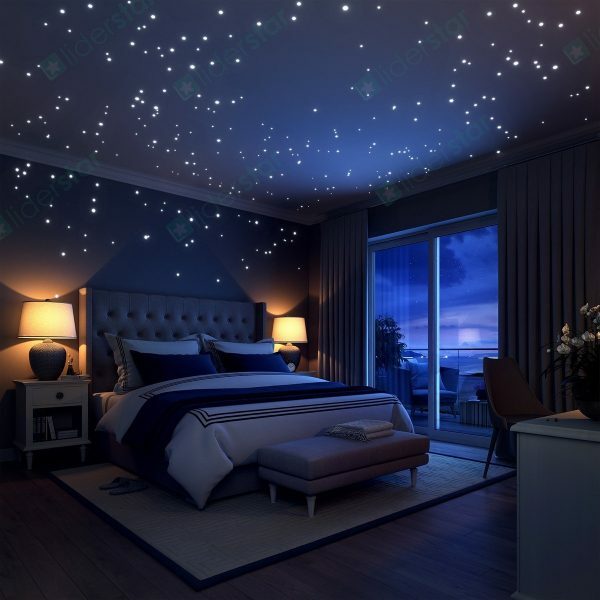 Glow In The Dark Space-Themed Bedroom Decoration: Create your own romantic haven with these glowing stickers on your bedroom ceiling. Glow In The Dark Space Wall Stickers: Eight planets and forty glowing stars come in this pack designed for your kids’ bedroom. Make them excited for bedtime, with these green-glow stickers awaiting their walls. 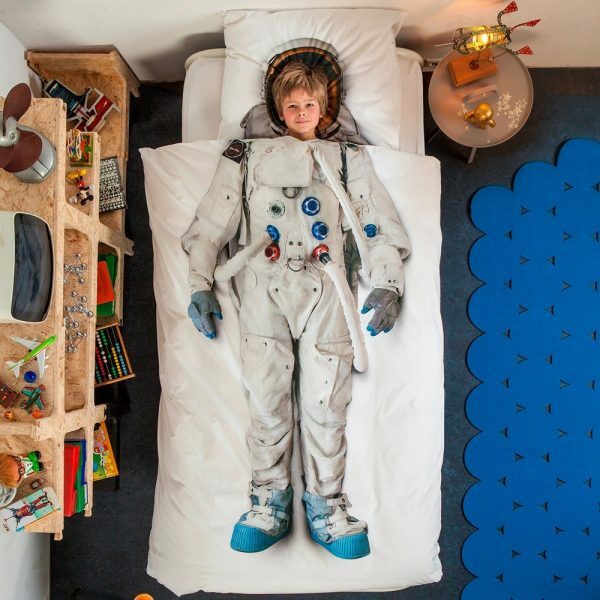 Snurk Astronaut Duvet Cover: Have a little boy or girl that can’t wait to be an astronaut? Make their dreams come true at night time, with this cotton duvet set with matching helmet pillow. Ursa Major Duvet Cover: Aware of a constellation in the shape of a bear? 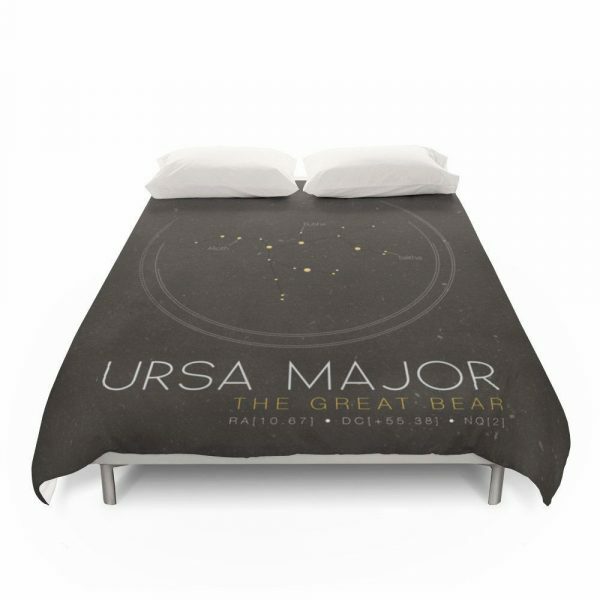 Sleep under Ursa Major in this machine-washable duvet cover. Space-Themed Constellation Bed Set: This reversible bedding set lets your kids sleep among the stars. 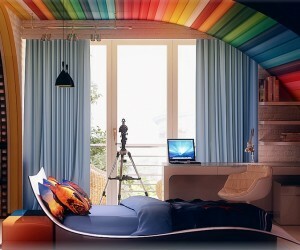 High quality polyester covers its sheets, pillows and duvet cover. 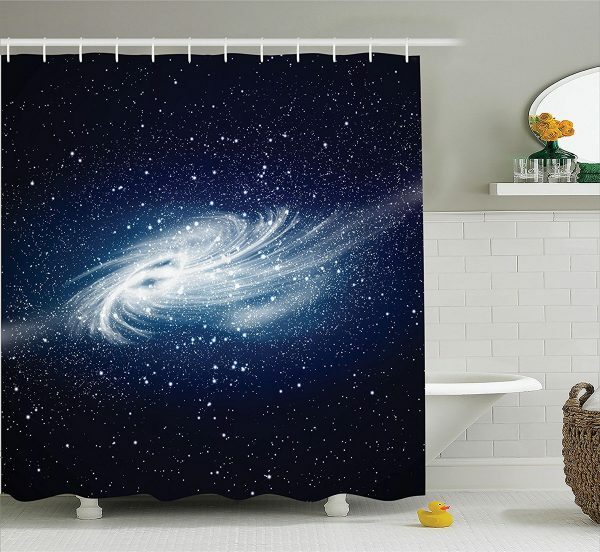 Space-Themed Shower Curtains: Waterproof and mould-resistant, this Milky Way shower curtain brings bath time dreaming closer to the stars. Space-Themed Throw Pillows: Want to give your couch some space-age loving? Adorn it with these canvas cushions depicting astronauts and capsules. 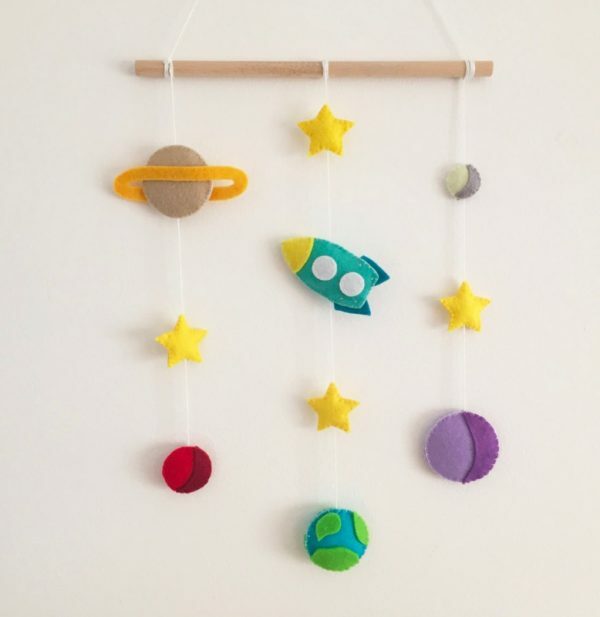 Outer Space-Themed Nursery Decor: Felt, wood and white thread assemble to create this cute and chic mobile for your new addition. Dangle it above their cot for their first introduction to the solar system. Luna Moon-Shaped Rug: After a space-themed piece that doesn’t look kitsch? This moon-shaped rug possesses the elegance you need in the quality of New Zealand wool. Cheaper options are available at Amazon. 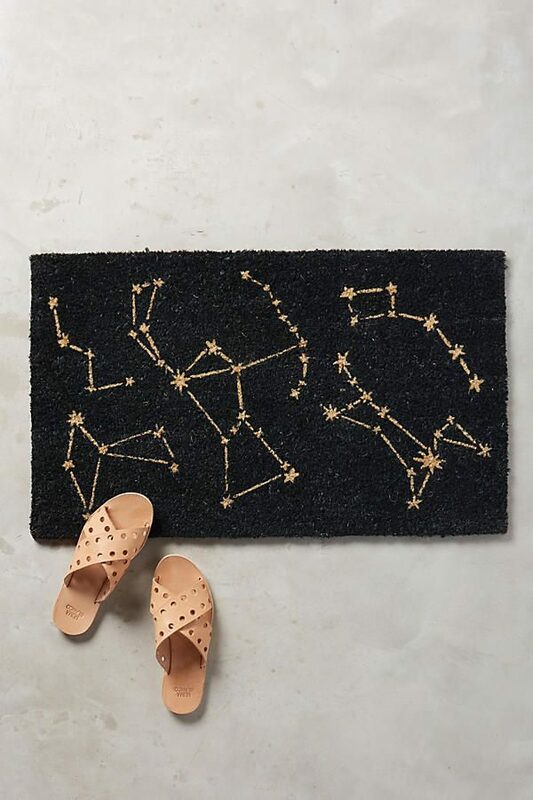 Astronomy-Themed Constellations Doormat: Coarse coir fibres look after the environment in these novelty doormats depicting constellations. Place one astride your front door for a fade-resistant way to clean your shoes. NASA JPL Space Tourism Posters: Instead of Rome, Prague or Paris, why not travel to Jupiter? These unusual space advertising posters could cause a stir in your living room. SpaceX Mars Tourism Posters: Californian SpaceX wants to fly you to Mars. Get extra-terrestrial at home, with these pro-Mars posters in your library or lounge. 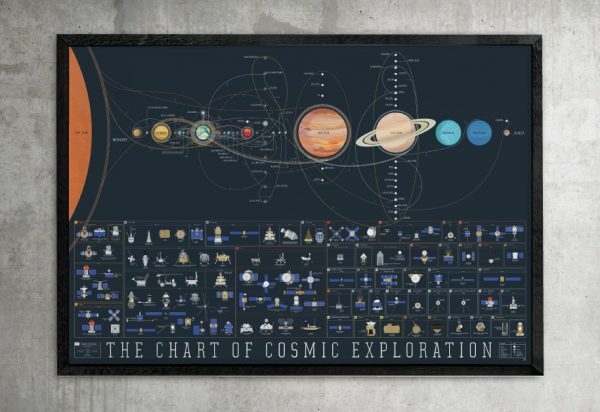 Space Exploration Infographics Poster: Unsure of how many craft have orbited, landed or attempted the galaxy? This infographic poster colour-codes the fate of each craft. 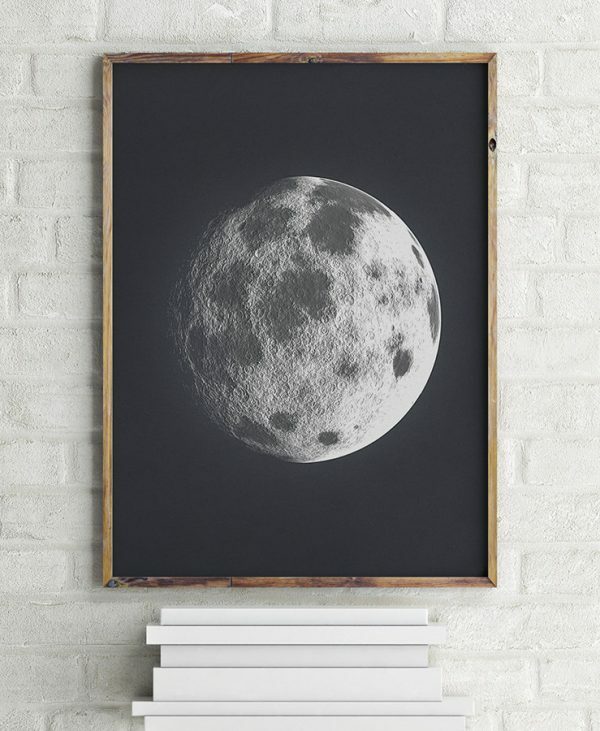 Astronomy-Themed Wall Art: The moon has been a source of inspiration for centuries. See what the ancients saw, with this picture of the moon decorating your hallway. 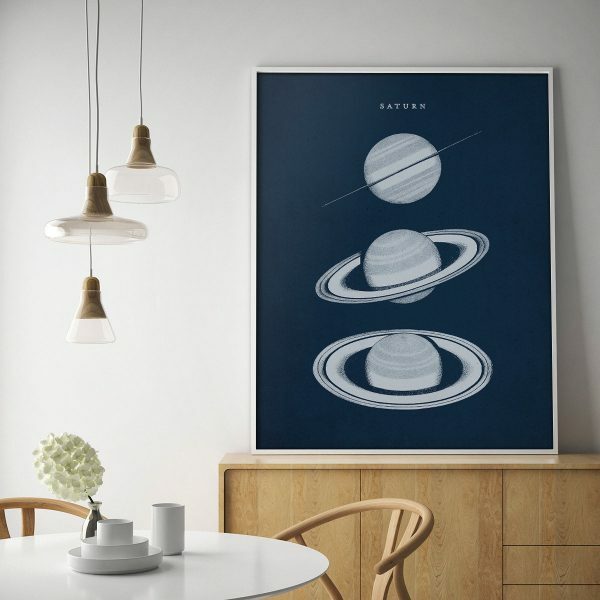 Saturn Art Print: Prefer the loopy rings of Saturn? See it three ways, with this wall print showing three different angles. 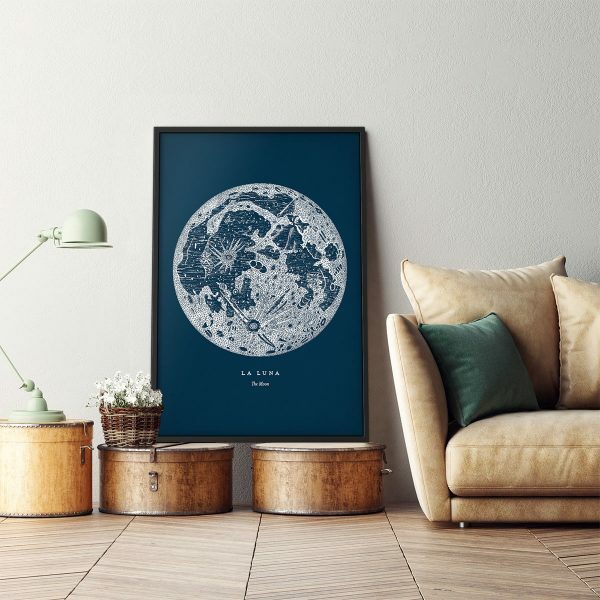 Framed Moon Print: Enhanced with an antique-look patina, this large-scale moon print is available in six colours, for a closer look at the body we orbit. 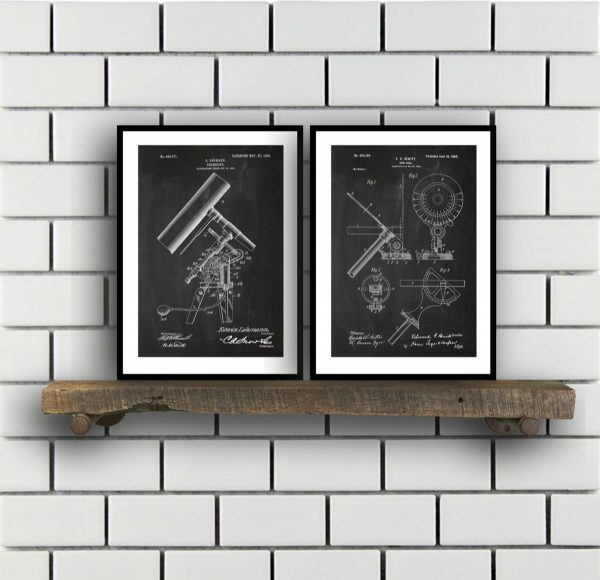 Astronomy Patent Posters: Interested in the patents of telescopes or craft? These handmade posters show our intergalactic creations in detail. 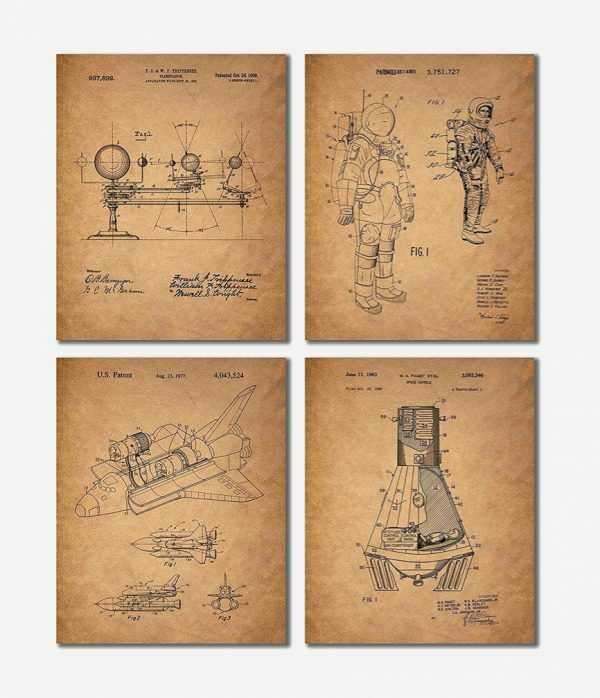 Vintage Space Patent Prints: For a more authentic look, these patents on brown paper cast your mind back to the age of their invention. 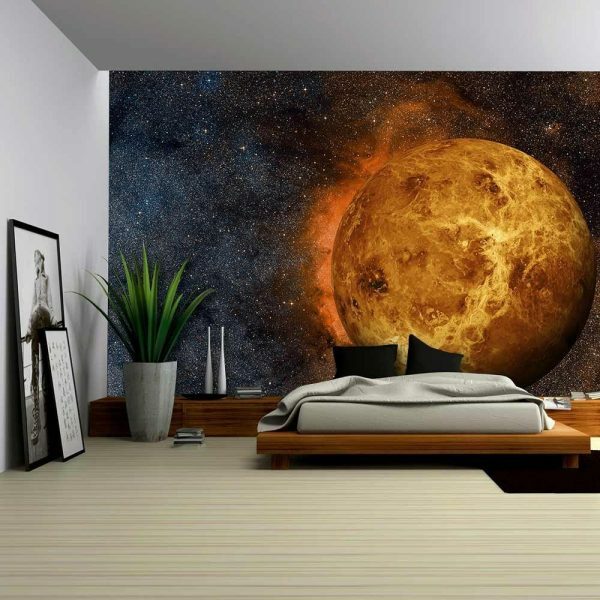 Outer Space-Themed Wall Mural Of Planet Venus : Sometimes a room needs a bold feature wall. This large-scale mural of Venus comes in six parts for a peel-on, peel-off and wipeable design solution. 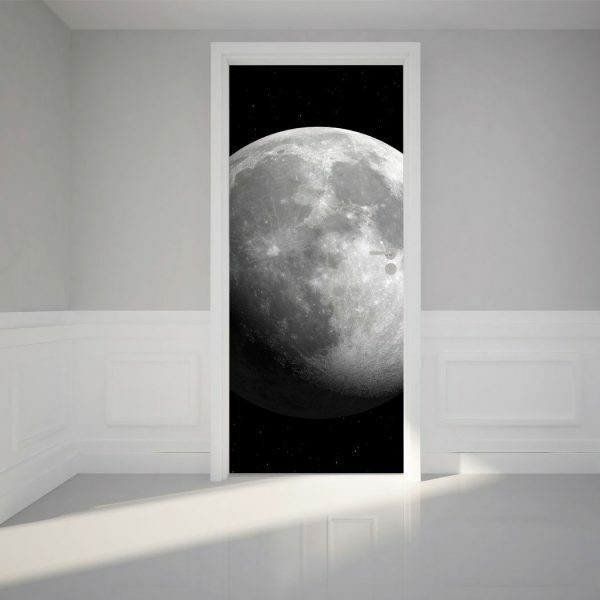 Moon Door Sticker: Imagine your door was a portal to the moon. This adhesive door decal comes in two parts, for a distinctive design that will keep guests guessing. 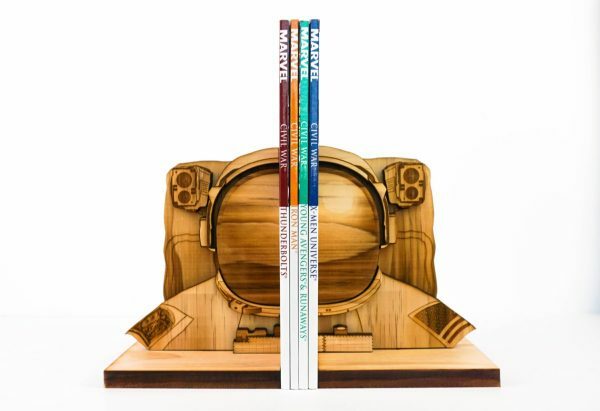 Astronaut Bookends Handmade from wood, these unique bookends are made to order. Stand their cork-lined bottoms astride your sci-fi reads, for bookends and reads that get matchy-matchy. 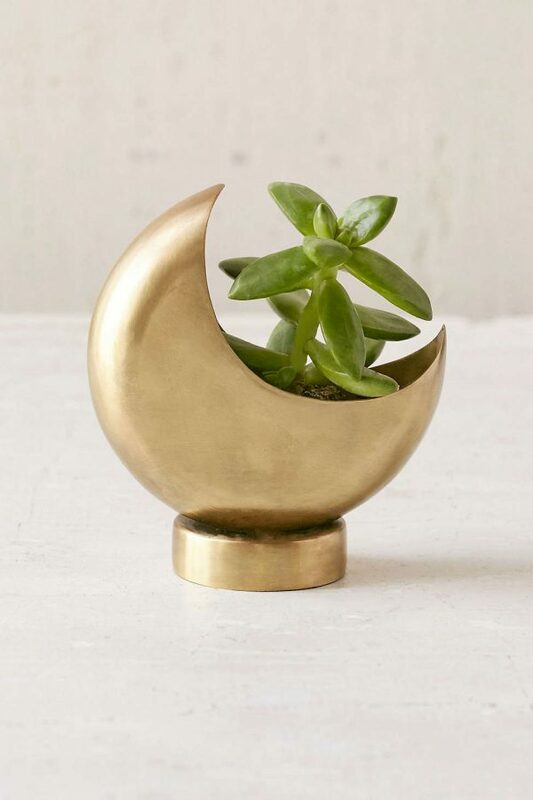 Half-Moon Planter: Set your indoor pot plant against the shape of the moon. These unique planters cast in metal bronze finish lend an alternative frame to succulents and herbs. 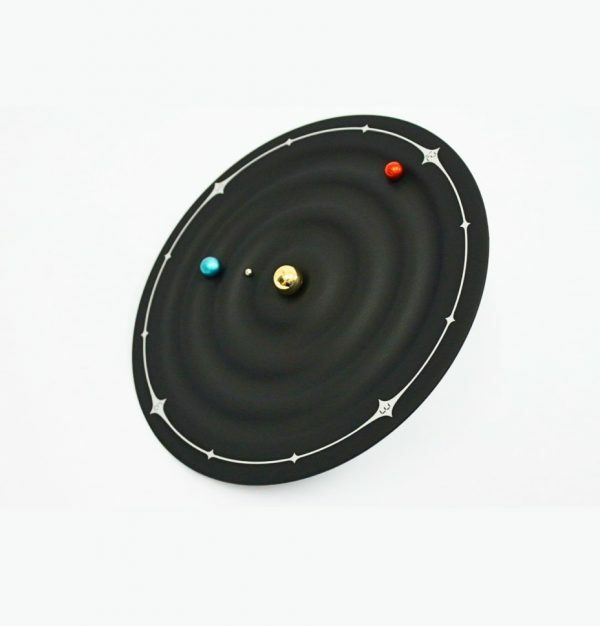 Galaxy Magnetic Wall Clock: Depict the time and planetary orbits with these unique wall clocks. 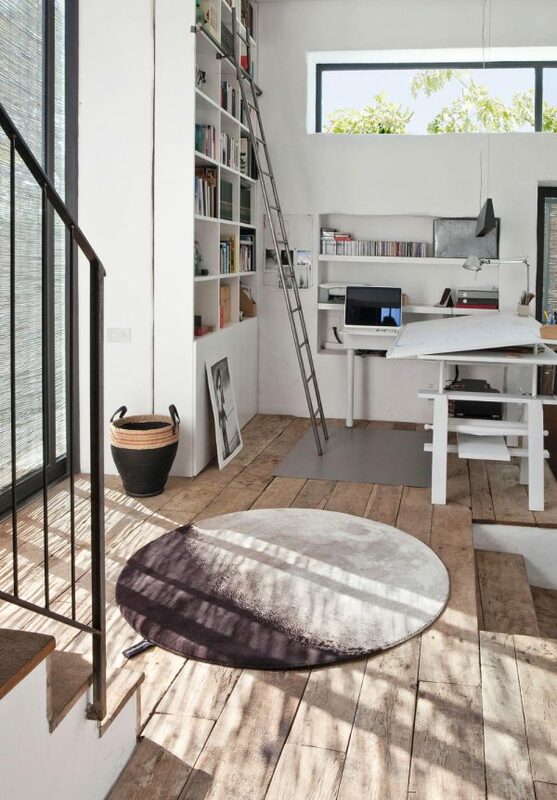 Aluminium discs ride around a rubber-coated surface you can stand on your desk or hang on your wall. 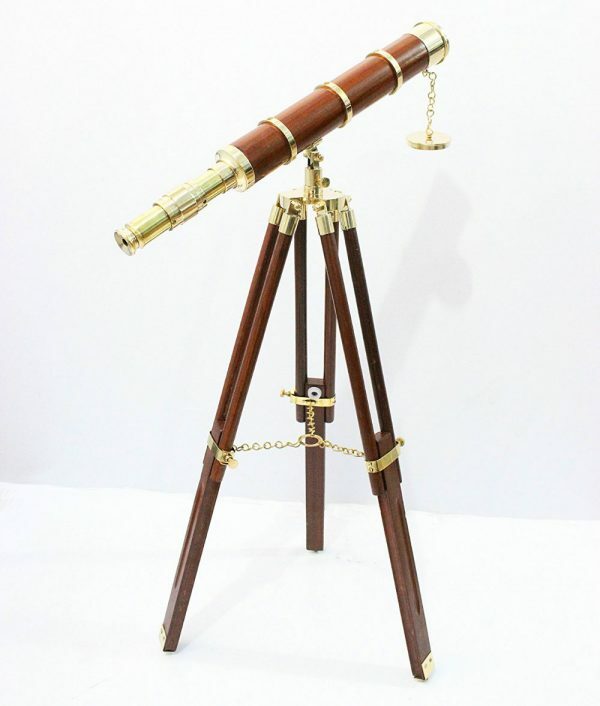 Vintage Decorative Telescope: House a vintage telescope in your seaside home. Originally designed for sailing purposes, this telescope is a decorative-only nautical home décor addition. 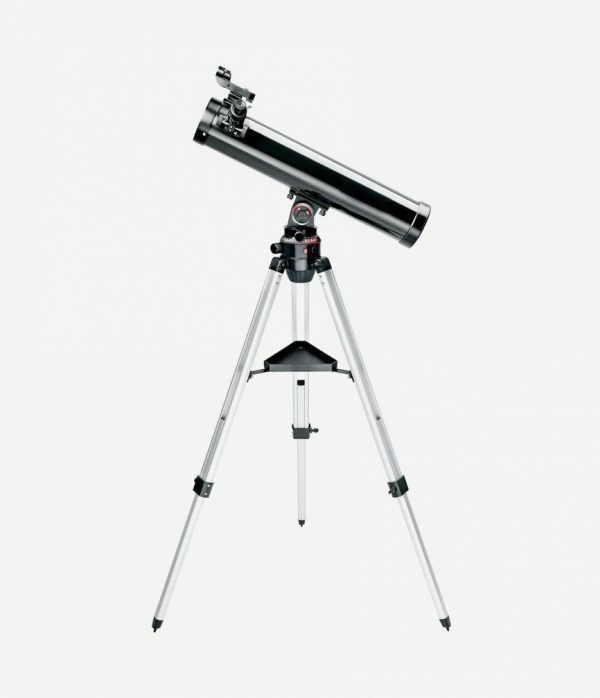 Modern Astronomical Telescope: Prefer a telescope more modern in look? This shiny contraption helps you decorate your library and see the stars. 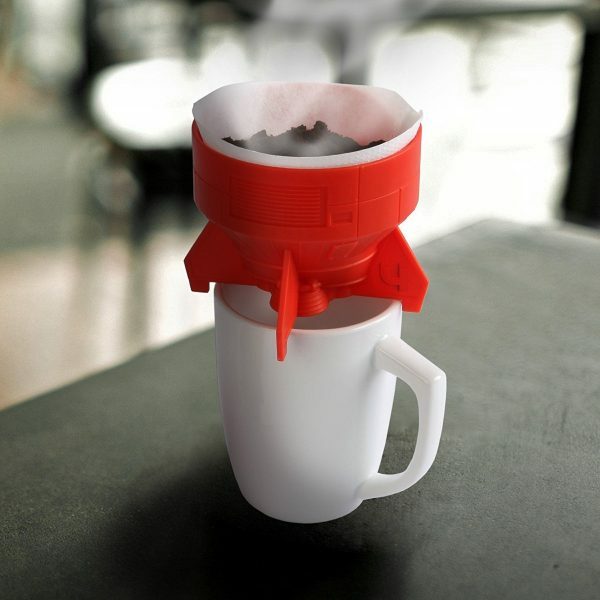 Rocket Fuel Pour-Over Coffee Brewer: Brewing for one? Put a rocket over your morning coffee, with these dishwasher-safe unique coffee cups. 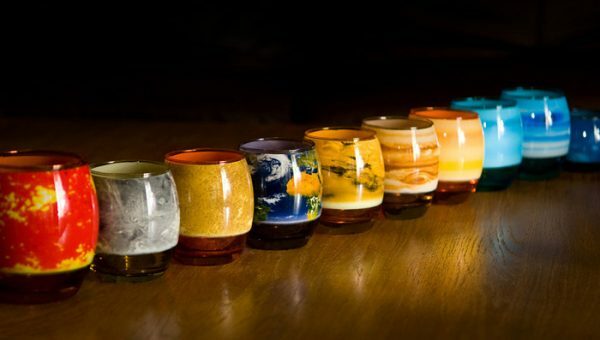 Planetary Glass Set: Sized according to their scale, this set of ten planet and moon-shaded glasses inject more joy into your tipple. 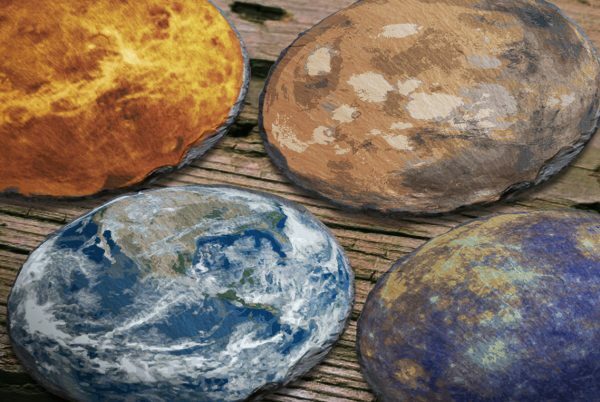 Planet Coasters: Stone and slate hold the pattern of the planets, in these unique drink coasters jazzing up your kitchen. 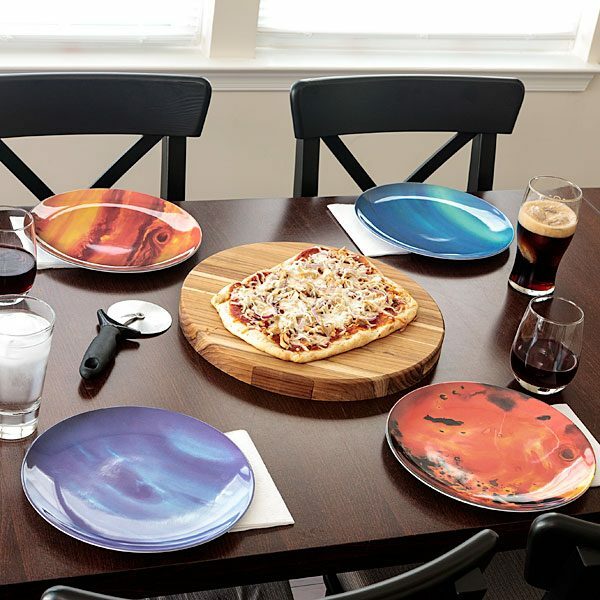 Astronomy-Themed Planetary Dinner Plates: Eating amongst the stars never was easier. This set of ten melamine unique flatware plates resemble the planets, moon and sun. Rocket Salt & Pepper Shaker Mill: Solid beechwood with a ceramic interior ensures these separately-sold grinders season up a storm. 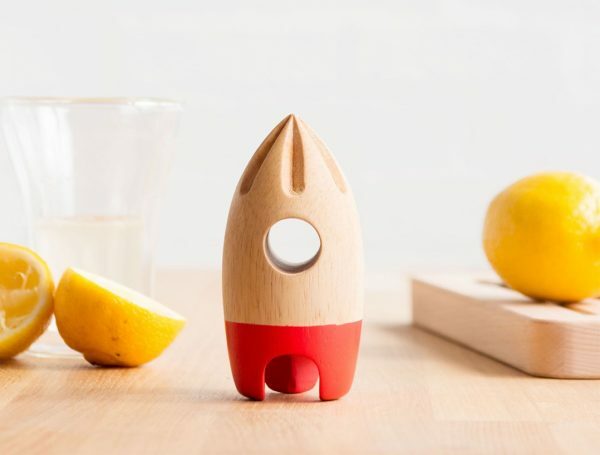 Rocket Lemon Juicer: This solid beech wood lemon juicer is a simple way to make your meals stratospheric. 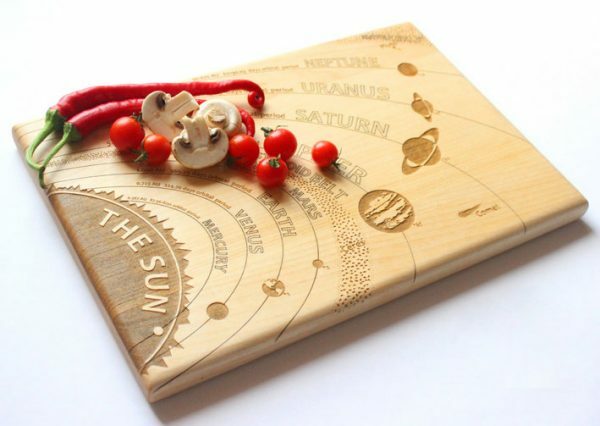 Solar System Cutting Board: Maple wood and beeswax combine in these unique cutting boards showing the solar system. Use their laser-cut form to chop your onions, garlic, tomatoes and chilli.